“Scotty, I’ve got a case for you.” It was Ralph, and I thought, Oh, Christ. Ralph’s gravelly voice was distinctive—a voice much older than his 48 years. And it was with these words he started all our conversations so there could be no confusion it was him. Ralph called me a lot in those days and, with no office personnel to serve as gatekeepers for incoming calls, and desperate for new clients, I was compelled to answer the telephone whenever it rang. Yep, it was Ralph, and I was trapped. I had represented Ralph the year before in a workplace discrimination case against a small company in Alameda, where I rented an equally ratty apartment. I got Ralph a decent cash settlement for not much work on his part, which made him very happy and gave him a taste of the power sometimes associated with bringing lawsuits. Since settling that case, he’d call me often, asking if I would represent him in disputes over, well, nearly anything; sometimes they involved conspiracy themes that were worthy of Hollywood movies or were calculated to champion issues he was certain supported the common good but were, more likely, exclusively of benefit to him. Divorcing my attention from these thoughts, I listened intently as Ralph’s story picked up steam. He went on to explain how, just a day or two earlier, some managers, scientists and public relations people from the refinery had held a town-hall meeting at Crockett’s Community Center on Pomona Street, not far from his home, and just a couple of miles northeast and downwind of the Unocal refinery. Several Crockett residents, including Ralph, had attended the meeting. According to Ralph, these residents were outraged and scared for themselves and their families, having been sickened by some airborne pollutants Unocal had recently released. Ralph was furious that Unocal wasn’t, beyond this meeting, openly sharing what it had done. According to what he’d gathered, just before 7 a.m. on August 22, 1994, a few workers at the Unocal refinery noticed some kind of liquid solution leaking from a hole that developed around 140 feet up the side of one of its “unicracker” towers. They called the leaking unit “D-409,” and it was one of these tall towers where hydrocarbons were cracked (i.e., broken down into their chemical pieces in a high-temperature, high-pressure system). This leaking solution was a highly alkaline substance which contained known carcinogens and was unquestionably known to Unocal to be highly toxic. Workers at the tower quickly reported the leak to the refinery’s management, a refinery-wide emergency was declared, and the County Health Services Department was notified. But, when it called the county, Unocal lied by claiming the leak didn’t pose any danger. Blindly trusting this statement, the county did absolutely nothing. Beyond that call to the county, no agencies were informed of the leak, nor were residents of the neighboring towns, either by Unocal or by the county, until long after the end of this 16-day event. Once aware of the leak, Unocal workers also started to shut down flows to D-409. This reaction was consistent with standard operating procedures, but what happened next was not; within a short time, the order to cease operations was countermanded by the refinery’s second-in-command. After hastily-called meetings between some supervisors and engineers (but excluding health and safety consultants), Unocal’s corporate office in Los Angeles ordered the unit be brought back up and to keep it running until its next scheduled maintenance on October 8. According to John, the workers at the tower were pretty pissed off at this decision but, despite their anger, continued to work the tower, trying to contain the release by hosing down the unit with water. All the while they kept running it, they were being lied to by upper management, being told that the toxic compound was safe. Having lived in San Francisco for many years as a college undergraduate, and then a graduate student, I can assure you of one thing: Crockett is nothing like The City. But that’s not to derogate Crockett. Not one bit. Indeed, for a town that, from its many vista points, overlooks expansive bays, a panorama of mountains—Tamalpais, Mendocino, the Sierra Nevadas—and high-priced venues like Marin County and San Francisco, you might think Crockett’s residents envy what they can only see from afar. But you’d be wrong. The people of Crockett are not well-off financially, but they have a community pride reminiscent of any small Middle American town, despite their famous neighbors. Crockett is a provincial place where, despite being somewhat divided geographically by the Interstate and pockets of terrain so steep as to make further housing development impossible, people want to know their neighbors. To them, these community bonds are important for typical social reasons, but they’re also a clever collective bargaining tool to better capture the attention of county officials, or when making demands upon any of the several petroleum refineries and other heavy industrial facilities that surround them. In Crockett, nearly all the few dozen businesses nestled together along its tiny downtown strip are locally owned, mostly by the same townspeople who host the many yard sales, street clean-ups, barbecues, Easter egg hunts, bicycle races, fish fries, crab feeds, and bocce leagues you’ll find there. And it is that down-home flavor that’s kept families there for generations. You could say that this is a forgotten place, but that might suggest that, at one point in time, it was anything more than an accident that someone from the outside world stopped here. That would simply be untrue. Suffice it to say that no one on Wall Street cares or probably ever heard about Crockett, but they have sure heard about the oil refining facilities there. 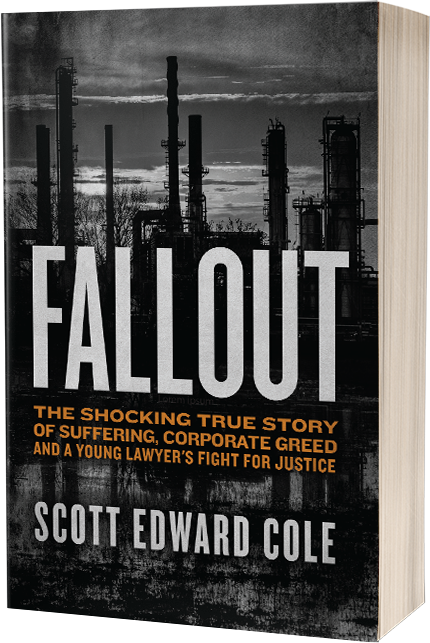 Within a five-mile radius, you’ve got Shell Oil, Tosco, Chevron and dozens of other major corporations directly or indirectly tied to Big Oil, most of which have been there a very long time. By the time of the Catacarb chemical release in 1994, however, Crockett’s prosperity was gone. Only a small percentage of the town’s multi-generational families were employed at the C&H headquarters and, with most C&H workers living elsewhere, workers’ wages were also going elsewhere. The sugar plant was still going strong but, by 1994, that strength wasn’t helping Crockett. The town wasn’t dead, but, with few local businesses to energize it, Crockett was on life support. It’s always the same; the powerful can abuse the powerless, the disenfranchised—whether they are minorities, the poor, consumers or workers—for only so long. And then labor unions form, and civil rights movements begin. If it’s true that most people inevitably get treated the way they permit themselves to be treated, and I think that is true, then change doesn’t spring naturally from an acknowledgment by the ruling class of its immorality but, more often, out of the activism of the oppressed. If you agree, then you’ll understand why I work for the people, and not companies. It’s not that I dislike companies. I own a company. But I work for the little guy because leveling the playing field requires organization and someone willing to lead others to action. I’m no Eugene Debs or some other famous modern-day social leader, but I yearn to mobilize people to demand better treatment. With the people of Crockett, in 1994, I got that chance. Prior to the Unocal release, impoverished and discounted Crockett was like dry grass begging for a match. Unocal and its nearby industrial cousins had been spewing nastiness into the air for decades and the people were sick of it, literally. I had requested that Ralph give me contact information for his neighbors so I could conduct interviews and he obliged; I called them all, and every story I heard reinforced my conclusion that this town was fed up with the refinery and ready for a change. It was immediately evident that everyone was suffering badly. This chemical release had done a number on them the likes of which they’d never experienced before. And each one of them had heard about others feeling ill too—all over town, some of them for nearly a month now. Some of them were second- or even third-generation Crockett residents and, while they spoke with fondness of the C&H Sugar plant and what that company had done for Crockett over the decades, they hated Unocal. “That refinery always stinks,” they’d tell me. “It’s an eye sore,” they’d complain. “Unocal doesn’t contribute to or care about our community.” They’d phoned the refinery before about odors, with no observable response. In nearly every conversation, I would try to keep the topic on the Catacarb release, but the floodgates opened the moment I mentioned the purpose of my call. They wanted to talk about what a horrible neighbor Unocal was, generally, and how they were tired of being ignored. Concerning the Catacarb release, just like their eternal hatred of the polluter, their stories were the same—goop on their houses, cars, outdoor furniture, mailboxes, swing sets, garden fruits and vegetables, even the toys their kids forgot to bring inside. They were afraid to touch anything. Their stories about exposure to the chemical and lingering health effects also shared themes. Crockett has notoriously great weather and these people were often outside, particularly during the warm recent Labor Day weekend, when the release was most pronounced. They were gardening, barbecuing steaks, hiking in any one of the parks surrounding Crockett, swimming at the local community pool or just relaxing on their front porches socializing with neighbors. They were doing what many small-town people do—hanging out, walking their dogs, going to work, living easy. Not surprisingly, the children were even more susceptible, their relatively undeveloped immune systems less capable of rejecting the toxins. One homeowner spoke with a shaky voice about her kids having played with toys left in the backyard that were covered with a sticky, molasses-looking substance. Both of her children later developed chronic coughs and headaches and often cried, at times inconsolably, in pain. Her neighbor watched with horror the family’s dog scratching off his own fur before it, too, got very sick and needed veterinary treatment. Other pets weren’t so lucky and died in agony. These people worried about their children, their animals, about cancer, and about the apathy, perhaps even derision, of a company that could sit idly by, raking in billions in profits, while its product burned and poisoned so many. There was a case here all right—a big one. Listening to all of this, I didn’t care if Unocal, or the county for that matter, ever broke down and confessed their sins over this. I had everything I needed right there with those stories. These people were badly damaged, livid and terrified, and everyone was asking me what I intended to do about it. And then they asked for my contract so they could be a part of it. It didn’t matter anymore that I knew we’d be out-matched. This town needed a change. This was a revolt and I was caught in its vortex. Filing a Complaint is the declaration of war in any civil suit. It announces to the world that you mean business and gives the court power to take action—hopefully, ultimately, in your favor. A Complaint identifies the parties bringing the case (the plaintiffs) and those who allegedly caused the harm and against whom damages, penalties or other remedies are being sought (the defendants). It also sets out, at least in general terms, the events alleged to have occurred, and how those events violated some duty recognized under the law. When you tell someone, “I’ll see you in court,” filing a Complaint tells them you weren’t kidding around. Of course, whether you know how to properly draft a Complaint dictates whether the party receiving it is going to take you seriously or see you as a novice. As you might expect, it’s tough to intimidate a multi-national corporation and its robust team of seasoned and well-funded attorneys with virtually no support staff, almost no financial resources and little experience. If you decide to undertake litigation under these conditions anyway, then good luck to you. If you decide to up the ante and make your lawsuit a class action—especially one on behalf of thousands—then I hope you’re an excellent poker player. It was for these reasons I was more than a little tense when Doug suggested I draft a class action Complaint against Unocal. I saw a lot of familiar faces that night and it gave me pride that they cared, listened, and showed up. They were the homeowners and business owners we’d met, frustrated by their financial losses, teary-eyed parents, with frightened and confused children on their laps, burly construction workers, furious, cursing, sometimes leaping up, almost toppling their own chairs, all to amplify their voices, to point fingers at the spokespeople. In the beginning, the panel members stumbled over their own words, trying to stay poised but answering rapidly before the next indictment came. They soon gave that up, electing to sit quietly and submissively, saying as little as possible in the face of tremendous abuse. A few times, mothers or fathers stood up to address the stage, determined to stay composed while telling anecdotes of their sick family and disbelief that the company didn’t afford them the right to know what was happening, to let them get out of town with their kids while it was still safe. Generally, those stories would end awkwardly and abruptly, with the parents too distraught and defeated to finish, choking on their own words, unsure where to go next, and then slowly, self-consciously sitting back down. If you haven’t experienced this sort of thing before, I can tell you it’s both thrilling and horrifying to be trapped at the back wall of a packed room of hundreds, watching people going out of their minds, launching the most vicious attacks, and getting either no response at all from the panel or more false assurances that their fears are unwarranted, that everything is just fine. But, that night, everybody knew damn well it wasn’t fine, and that it might never be. The overwhelming wall of sound made my breathing labored. I wanted to get out of there fast. This wasn’t safe. As I saw it, if any of these people had brought a pitchfork or torch or, worse yet, a gun, no one would have been in any position to stop what was bound to happen next. There was no security detail for the speakers, and no way for any of us to get out before the emotional freight train slowed down, save for forcibly breaking through the dense pack of onlookers now blocking the only two exits, some 60 feet from where I stood. People poured out of the hall and just kept walking—all the way home in the dark, or to their cars, too lost in their own thoughts to socialize. I understood. I wanted my freedom too. Twenty minutes later, Doug and I were back in my car, somber and silently driving south. I can’t speak for him, but I was feeling profoundly sad, and, at least for the remainder of that evening, I just wanted to forget about Crockett. I’ve always understood that your perception is your reality. When it comes to power, if you think you have none, then you have none. Confidence is king and, if you don’t naturally have it, fake it. With their marble, glass and wood-inlaid fortresses, big law firms are often masters at shaping perceptions that they have a monopoly on power. Just go and visit any one of the nation’s largest law firms—those hired to protect, at great expense, the legal interests of our country’s most profitable corporations—and you’ll see what I mean. They’ll put on a dazzling show for you, not unlike the puffer fish that blows itself up like a balloon to ward off predators. It’s all intended to convince you that their firm is the best, if for no other reason than the ample resources they have at their disposal. These large firms have disproportionately large reception areas and conference rooms as a display of their grandeur, yet provide tiny working spaces for their employees. They’ll commission gorgeous web sites, but serve cheap coffee. Their post-modern décor, disdainful attitudes, and Ivy League accomplishments, often displayed behind their desks in oversized frames scream “leave us alone” or, more accurately, “leave our clients alone.” For new lawyers and seasoned practitioners alike, at least those unfamiliar with puffer-fish trickery, it’s natural to presume that this opulence and ornamentation must be the product of superior lawyering. Indeed, inculcating the belief that skill and financial prosperity are inextricably intertwined is at the core of big-firm marketing. With an office the size of a two-car garage, no big company executives would have taken me seriously had I ever let them see my work space. In fact, that’s why I utilized a large communal conference room in a separate wing of my office building to conduct important meetings. It’s also why I devoted the majority of my already-tiny floor plan to a Reception area. I was forced to master the smoke-and-mirrors approach to small firm practice. And, so far, it was working, like that same approach had worked all my life. Starting as a little kid, I got good at bluffing my way through situations, even really threatening ones. I figured that, if it worked so far, why stop now? Pulling into Unocal’s Administration parking lot the morning of the tour, I looked around rapidly, wondering if anyone who’d seen my little red car during the prior year’s reconnaissance mission with Doug was watching. I’d driven on the main road by this lot many times since, but stopping to get more photos this particular day felt like I was returning to the scene of a crime. Other Committee attorneys were showing up at the same time, most of whom were driving cars far more expensive and cleaner than mine. To avoid scrutiny, I parked at the far end of the lot. I had long-since been sized up by everyone as the new kid on the block and, at my age, it would’ve been tough to convince anyone otherwise. Still, I was uncomfortable displaying anything that would suggest my lack of experience or success. I turned the car off, waited until no one was looking in my direction, and then hurriedly walked across the parking lot, past the Benz’s and Porsches, toward our meeting area. Walking single-file out of the conference room’s side entrance and down the few short stairs that dropped us into the refinery was kind of like Alice stepping out into Wonderland. It was an enormous, fantastical place, bubbling with energy and smells, hissing steam, workers pointing in all directions and managers yelling commands over the din. I’d driven through refineries before but had never walked through one, but no matter; I had already made my mind up about them. I’d already decided to loathe this place, condemn it, right along with those people who managed it. It wouldn’t matter what amazing things I might see there that day. My mind’s eye envisioned a wretched, grimy scene, driven by brawny, defeated men with sweaty, oil-blackened faces, unappreciated slaves forced to toil down dark corridors and under a canopy of rusty, decaying machinery with steam and liquids of dubious origin dripping everywhere. Prior to our tour, it may even have been that way, but not today. My God, that place was clean, too clean. I knew a good whitewash when I saw it, and I knew Unocal had a talent for it. This was all window dressing for the unsuspecting, but I knew. The other Committee lawyers knew too. The company had mapped out with precision our walking route through the labyrinth of piping to the places specifically designated in our inspection request—the only places we were allowed to go—and then fastidiously scrubbed that path, and only that path. It was spotless, and we were shepherded through it with care such that we’d see only Spotless. Lagging behind or drifting more than ten feet away from the pack was met with an admonishment by Kenecke’s lawyers to get back in line, little dictators that they were. Unocal’s attorneys, appointed as watchdogs for this outing, barked at us frequently in ineffectual displays of authority but, ultimately, knew our Committee would be back if we were denied the opportunity to see everything. And we knew that they knew this, and so we had no intention of backing down just because some corporate lawyers wanted to impress their client. This was our time to soak it all in, and so we went where we wanted. To my mind, there are litigators, and then there are trial lawyers, and they are very different breeds. Once in a while, you’ll run across the attorney who is both, but it’s rare. The skill set of a great litigator includes first-rate research and writing abilities, a nuanced understanding of discovery procedures, and the creativity to game out multiple scenarios, seeing several moves ahead. Litigators file the lawsuits, gather the evidence and build the cases, arguing motions and taking depositions along the way. They approach their work in a cerebral manner, but they usually see the end-game as settlement. In fact, it is not uncommon for a litigator to partner with a trial attorney once it’s clear the case requires the verdict of a judge or jury. It is also not uncommon for an overly confident litigator to assume he can do it all, try his case, and lose miserably. Great trial lawyers, by contrast, are like stage actors. Is that too noble? Well, maybe more like film or even soap stars, but rarely as strikingly good-looking or suave. They don’t need to be powerful writers, but they have to understand human psychology, how to connect with lay people and how to weave dull facts into riveting, conspiratorial tales of deception, neglect and greed. They also need to artfully draw out witnesses, eliciting painful storytelling or, conversely, disclosures against interest during brutal cross-examination. If you live too much “in your head,” you won’t be a great trial lawyer. You need to get outside yourself, be flamboyant, a facilitator, a translator of sophisticated legal concepts into stuff even a schoolkid would understand. If you tell people outside of the legal profession you are a litigator, they seldom know exactly what you mean. Telling them you are a trial attorney, however, immediately evokes all kinds of images and scenes from television shows. Yet—and I probably don’t need to point this out—trying a case has almost nothing in common with what’s depicted on TV. Yes, of course you’re expected to question witnesses, make objections and, if you’re a real hotshot, present a blistering closing argument. You don’t, however, get to threaten your opposing counsel in open court, date the judge, prance around and talk directly to jurors, or berate witnesses relentlessly in hopes they’ll break down and confess their sins. Even try to do those things, and you’ll get lambasted, fined or thrown in jail. If I was anything at this early point in my career, I was a budding litigator—but one who longed to be a trial lawyer. In school, I read about Clarence Darrow, the iconic trial advocate, and I dreamed of being what he’d been—a controversial defender known for taking on the tough, unpopular cases, and winning through brilliant oratory. I wanted to be exalted for my masterful courtroom interrogations and exposé of all things unjust, and I thought I had the fundamentals for it. I aced my Evidence class in law school, so I knew my way around an objection, and my undergraduate communications degree and years of debate competition provided the groundwork for reading audiences well and thinking on my feet. What’s more, I loved a good fight. I’m a lawyer. Yes, I know what you’re thinking, but don’t hate me—at least not yet. Believe it or not, some of us went to law school to do what we considered “the right thing,” which, to most people, means something that protects the little guy, the under-represented. I consider being a “people’s lawyer” a noble calling, something worthy of long hours and personal sacrifices. Yes, I’m an idealist. I have always been an idealist and, luckily, the events this book brings to light didn’t change that, but they sure shook my faith at times. Other than changing the characters’ names to “protect the innocent” and enjoying some slight literary license to keep the action moving—this is a true story. My opinions about why people did certain things will, undoubtedly, ruffle some feathers. If that happens, particularly to the lawyers, I’m sure they’ll get over it. We all take hits in this profession from time to time. In other situations, such as where records still exist of the events recounted here, I tried to follow those records to the letter. For the most part, however, no outside resources were needed since I was there. I was always there since, at least as to the legal battle that this book describes, I started that battle, and it was a fascinating one. Indeed, many lawyers, myself included, say that reality is often crazier than fiction. Many parts of this historical account illustrate why that’s true. This book is about a lot of things but, first and foremost, it’s about me doing what I considered “the right thing.” My late father always said about choosing a career that, first and foremost, “Do what you love” and, so, I hope this story makes it obvious I absolutely love the law and the good that its practice can do to help level the playing field between people who otherwise have little voices and the people with the power and volume to talk over them. The story itself is classic. It’s an account of horrible corruption and the legal battle waged to address it, but it also honors the stories and experiences of those whom I call the “little voices,” the people traditionally without much power. And it’s about big-business practices in furtherance of corporate greed and about powerful people choosing to stay quiet about the truth, or to outright lie, while the little voices—maybe I should just call them “heroes”—took brave steps and made a lasting difference. Finally, enmeshed with those themes, it’s the story of me, at least a former version of me, when I was a bright-eyed 28-year-old kid, not even two years out of law school, who got a front-row seat to some amazing events and a remarkable level of human suffering, and who brought these happenings to light in a huge way. There was a toxic airborne chemical release from what was then the Unocal Refinery in Rodeo, California, in the late summer of 1994. The big voices let it go on for 16 days and it hurt people, ruined families and even led to deaths of those given no warning they were even at risk. It was simply catastrophic and, like after most instances of corporate malfeasance, an apology never came. I discovered the corporate efforts to cover up the impact of the event and decided to risk everything to stop it—ultimately filing a class action lawsuit that was later joined by dozens of other firms. With almost no resources, I represented nearly 1,100 people in the case born out of this tragic event and, in the process, witnessed a level of suffering that changed me. These people didn’t deserve what happened to them. They were just small-town people living small-town lives. They were the elderly, the middle-aged, the very young—even a couple of animals somehow found their way onto my client list. What happened during those 16 days was shameful—there is no other way to say it. The chemical release could have easily been avoided and, even after its discovery, it could have easily been stopped, thereby preventing years of agony. But that wasn’t in the cards because it would have limited profits. I bet I know why action wasn’t taken sooner, but it’s inevitably speculative. You can probably guess too. Maybe it’s because the victims lived in under-represented little blue-collar towns. Maybe Unocal really didn’t realize how far the toxin stream was traveling, although I don’t believe that for a second. Maybe Unocal didn’t understand the science of it well enough to know the damage it might do to the locals and their property. Maybe big corporations are inherently greedy and just can’t help themselves. While I may not know the reasons, I know the events and, for four years of my life, I helped lead the community in fighting back because what I saw disgusted me. More than 20 years later, I’m still haunted by some of my clients’ stories. Some of them I can’t share because they were told to me in confidence and that’s just how the privilege works. The ones I can share more than flesh out the aggregate experience of the victims of greed, laziness and indifference. While this book chronicles what I did during those years, I hope it’s the client experiences that carry it because it is for them that I wrote it. Indeed, long after the Unocal case file was archived and the lawyers went their separate ways, I remember best the client meetings at my little, run-down office, and sitting in well-worn chairs in shabby living rooms, and handing out tissues to people to dab the tears so they’d feel just a little less humiliated. Finally, as I journaled these events, I often asked myself: Does every good saga require that some lesson be extractable? Now that my journaling is done, I’m still not sure, but I think so—and it’s the same thing I’ve mentored young lawyers about now for years. It taught me the importance of remaining passionate about something, taking chances and journeying into places, situations and emotions bigger than what you thought possible—just because you can. Everyone has bravery inside. That sounds preachy and trite, maybe, but it’s so true. As you’ll see soon enough, I took a chance and it changed me, and that makes me think others can take big risks and make big changes too. It was my confidence in that which kept me going as I wrote this book. I like to witness people transform and recognize their capacity to influence others, policies and major events. But not everyone will have had that experience by the time they’ve finished this book and that’s all right. If even one person is impassioned enough to say “hell no to the status quo,” and stand up the next time his rights are threatened, even if on shaky legs, this effort to retell what happened back in 1994 will have been well worth it.